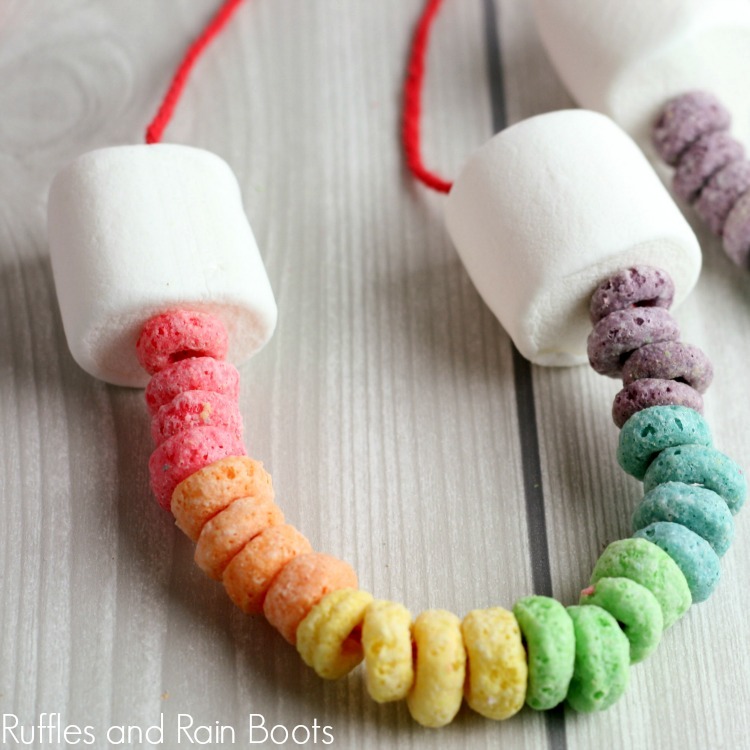 This adorable rainbow cereal necklace is a kid’s craft they’ll love to make and snack on. It’s fun, easy, and fun for all ages. Let’s get started. Here at Ruffles and Rain Boots, I love to share easy crafts for kids. St. Patrick’s Day has it’s own bit of added fun in that we can get away with TONS of rainbow crafts. 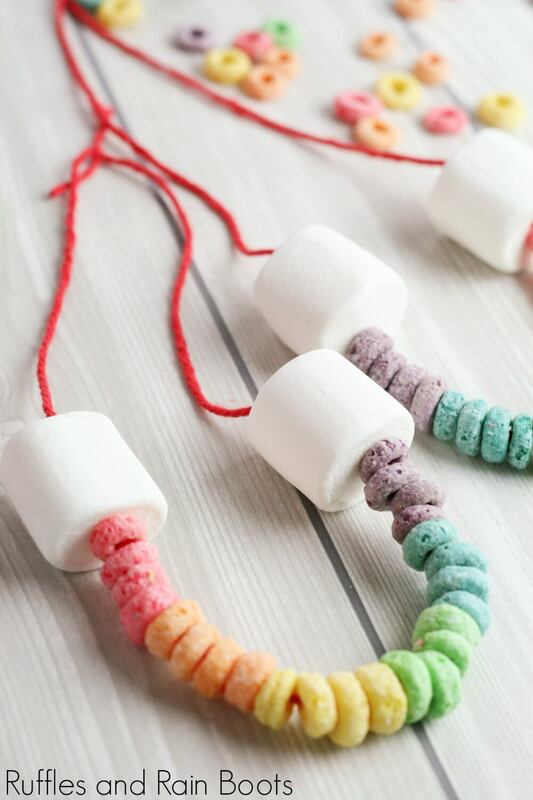 This rainbow cereal necklace is a great way to bring a little color into the day and is perfect for a family movie night treat. Plus, let’s face it – you’ll get a moment to catch your breath while they make it. Thinking of saving this craft for St. Patrick’s Day or a rainy day activity? Save it to your favorite Pinterest board. 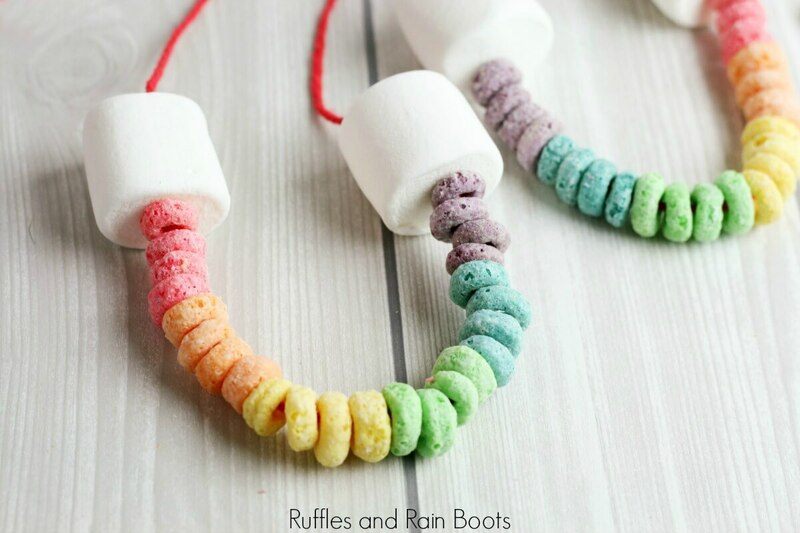 Whether you’re making these for the kids or giving them everything to whip them up, below are our instructions and tips for these rainbow necklaces. 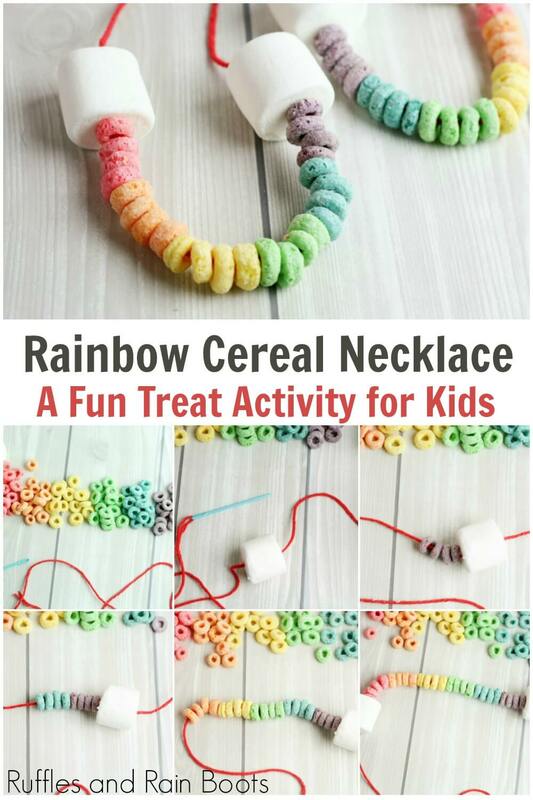 If you’re making a video playlist on YouTube, here is our rainbow cereal necklace video tutorial. 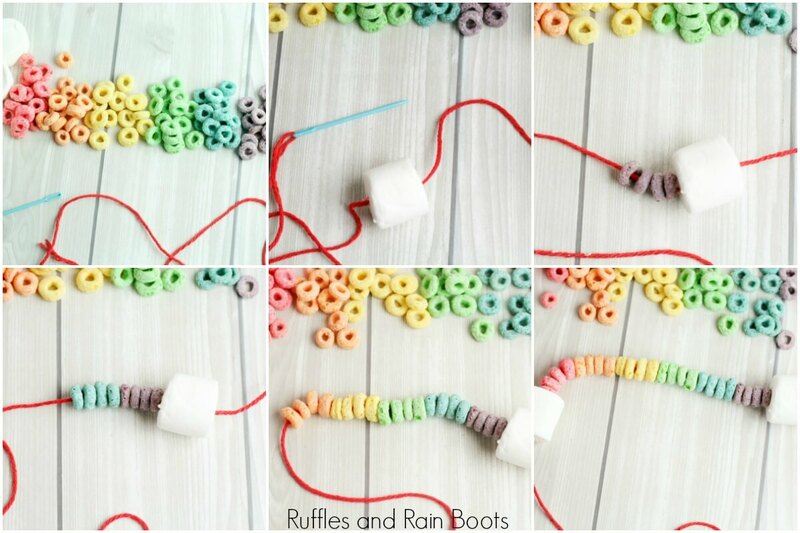 Grab some colorful cereal and make this rainbow cereal necklace for kids. It's a great way to spend St. Patrick's Day or make for a sweet treat. Cut the string or yarn to fit your child. Thread the yarn onto the needle and layout cereal and marshmallows. Allow your child to sort the cereal into colors. Thread a marshmallow followed by the following cereal colors in this order: purple, blue, green, yellow, orange, red. Finish the threading with another marshmallow. Tie off the yarn and the rainbow cereal necklace is done! Rainbows are loved by all. Check out these fun, colorful crafts here on Ruffles and Rain Boots. St. Patrick’s Day Pot of Gold Cupcakes – Candy rainbows are sure to please. Rainbow Rock Painting Idea – Even the youngest kiddos will have fun with these! Candy Rainbow Bark for the Luckiest Holiday – A sweet treat that looks as good as it tastes. Want More Crafty Fun Delivered? I strive to share quick, fun crafts for all ages. Sign up for our weekly newsletter to get inspiration delivered right to your inbox. You’ll also get access to both our exclusive craft library AND our hand lettering repository (in case you’d like to try your hand at that). Your shares are how this site grows and I am sincerely grateful. Whether you save it to Pinterest or share on Facebook, I really do appreciate it.